Welcome to this Master Cattle Transporter training program. As a transporter you play a critical role in the health and welfare of the cattle we raise. The proper handling and transport of cattle can reduce sickness in calves, prevent bruises, and improve the quality of the meat from these animals. By using best practices you and other transporters literally save the beef cattle industry millions, if not billions, of dollars each year. Participation in this Master Cattle Transporter program is one way to show your customers that you are ready to take every step possible to keep their cattle healthy and safe as possible. This training will cover properly moving cattle up to and on to the trailer, distributing cattle correctly on the trailer, hauling techniques that reduce cattle stress, and handling emergency situations. On behalf of the over 800,000 cattle raisers in the United States I would like to express my appreciation to the vital work you do in delivering cattle safety to their destination. You are a critical link to our Beef Quality Assurance program. Moreover, we appreciate you joining us in meeting our goal of providing high quality and safe beef to the consumer. Many volunteer hours have gone into developing this program to provide you the best training possible. I would like to thank the animal handling and transport consultants, producers, auction operators, feedyard managers, packer representatives and university friends who have shared their time and insight with us in the production of this program. Again thank you for participating. 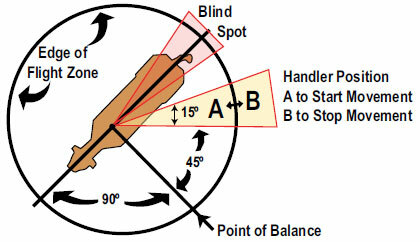 Cattle have a wide area of peripheral vision, with only a small blind spot immediately behind the animal. Do not approach cattle from directly behind. The flight zone is the distance that the cattle can be from you and still feel comfortable. You can use the flight zone to quietly move cattle. There is a place on the shoulder of the animal called the point of balance. 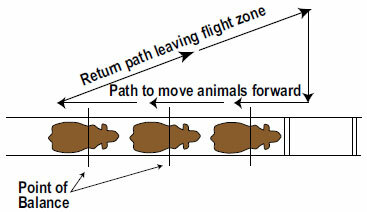 You can use this point to encourage the animal to go forward and backward. You should move cattle calmly and slowly. 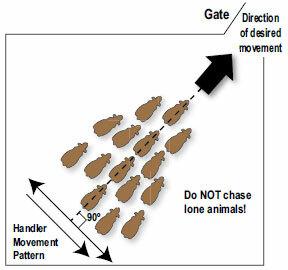 Quick movements and loud noises will make moving cattle more difficult. “Persuaders” such as flags, plastic paddles, and a stick with plastic ribbons should replace electric prods as much as possible. An electric prod should NOT be a person’s primary driving tool. It should only be picked up and used when absolutely required to move a stubborn animal and then should be put back down. “Persuaders” are the best tools for moving cattle. These devices can be used to turn cattle by blocking their vision on one side of their head. Extreme heat conditions exist when temperature and humidity are at levels in which they create a heat index greater than or equal to 100ºF. Heat index levels at 100ºF or greater pose a significant risk to stressed cattle. Avoid transporting cattle in extreme heat conditions (when temperature and humidity create heat indexes in gray zones (see the heat index chart). 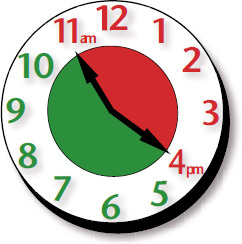 Avoid hauling and handling cattle between 11:00am and 4:00pm, which is often the hottest time of the day. If cattle must be hauled at times of high temperature and humidity, avoid stopping. Make stop durations as short as possible. Try stopping during cooler parts of the day if at all possible. Pick shaded areas if you have to stop. During hot weather consider placing fewer cattle on the trailer. When cattle are stressed in extreme heat conditions, they are more likely to become non-ambulatory, sick and even die. Extreme wind and cold conditions can have drastic adverse effect on the health of cattle. Unprotected cattle hauled at highway speeds can be subject to dangerous wind chill. If cattle are wet, the danger is even greater. Extreme cold and wind conditions exist when the wind chill is below 0ºF. Extreme wind and cold conditions can be viewed in the gray area of the wind chill index chart. Avoid transporting cattle in extreme wind and cold conditions. If cattle must be transported in cold and windy conditions, avoid stopping if at all possible. It is critical to deliver cattle to their destination as quickly as possible. Truck has been weighed empty (unless cattle were weighted on the ground). All gates and ramps are set before backing up to the chute. Gates are open and in good repair. Truck is backed up to load-out chute squarely and evenly. Avoid excess noise when backing up to the chute. Shut off engine before loading (to avoid noise from rattling bullrack). Chute is in good repair (if portable it must be properly anchored to truck). 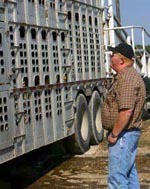 Approximate weight and size of cattle and head count are needed to estimate the number of cattle per compartment to load the trailer properly. Weigh truck full before leaving the facility (unless cattle were weighed on the ground). 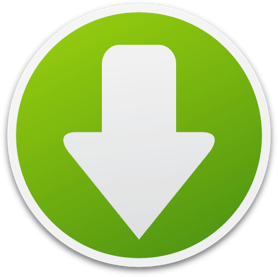 The values presented in this document are recommendations only. It is the driver’s responsibility to know the dimensions of the trailer, to load only the size of cattle that will safely and humanely fit the trailer and to adhere to the maximum legal load limit for the states in which they are operating. 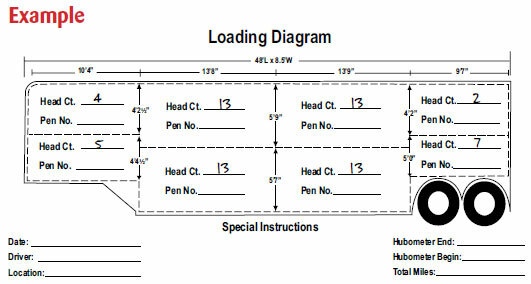 In order to accurately load the correct number of cattle and pounds on the trailer, consider developing a worksheet for your particular trailer as in the example shown below. All cattle appear healthy and no foot injuries are noted. Cattle being transported for slaughter meet the packing plants minimum weight requirements. 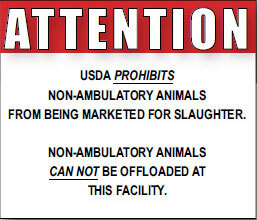 Cattle being transported for slaughter meet the USDA-FSIS minimum health requirements. Do not accept: cancer eyes, debilitated thin animals, downers, or animals that appear sick. If an individual animal passes the above requirements, but is STILL questionable and it MUST be loaded, be sure to load it onto the back end of the trailer (last on, first off ). 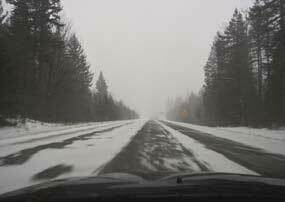 Check weather to determine if the road is clear and/or passable. Route has been determined, taking into account weather and road construction. Paperwork needed for transit and unloading is in the driver’s possession. Truck has been checked on all sides to make sure all cattle are standing and ready for travel. Pull away from chute slowly and make gentle turns. This is especially important the first hour on the road while cattle are getting their balance. Check cattle on a long haul after two hours on the road, and then every 4 hours after that. Remember to keep stops as short as possible in extreme heat or cold conditions. Determine if you are at the correct facility before unloading. Weigh truck if cattle are to be weighed on the truck. Back the trailer up to unloading chute squarely and evenly. 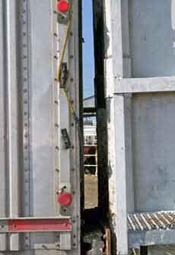 Determine if unloading chute is in good repair (if portable, it must be properly anchored to truck). Make sure the gates to the destination pen are open and the path is clear, then unload cattle from the truck. Use good, low stress handling procedures. Be sure the holding pen gate is shut for the cattle before pulling away from the chute. Weigh truck empty, unless cattle are weighed on the ground. Give all documents to the recipient of the cattle (health certificate, inspection papers, brand papers, etc.). In the event of a biosecurity concern, follow these procedures to aid in containment of disease, contamination, or intruder posing a threat to the health and well being of your livestock load. The first step is to assess the situation at hand. If the situation appears to be life threatening for you, other bystanders, or the livestock on your trailer, request emergency medical or law enforcement assistance immediately. Is it a disease or health concern of one or more animals on your load? Contact your dispatch office or local authorities and they will contact the appropriate officials. Wait for their instructions to proceed. Is it a contaminant concern? If a contaminant is suspected, pinpoint the source and isolate it. Set up a safe perimeter around your load, taking necessary precautions to protect the safety of yourself, bystanders, and the livestock. Contact your dispatch office or local authorities and they will contact the appropriate officials. Wait for their instructions to proceed. Is it an intruder concern? Be extremely cautious of strangers, even if they appear friendly. Do not allow anyone access to your load. In the event of an emergency, contact the local law enforcement agency and describe your location, the nature of the emergency, and include the information about your load. Create a list of contact people for each operation/location. Create a list of alternate delivery location(s) if cattle are in transit to the operation and they need to be cancelled or rerouted. Thank you for reading through the Master Cattle Transporter Guide.